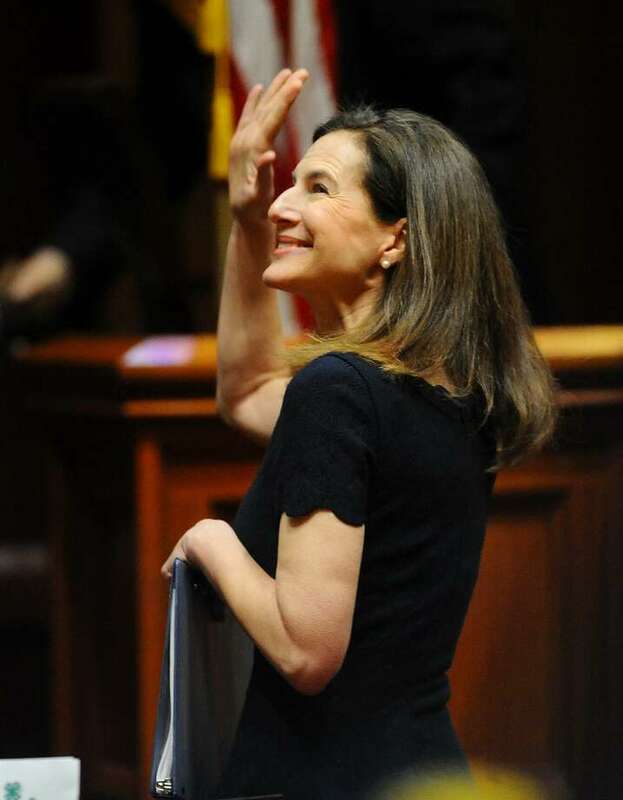 New Lieutenant Governor Susan Bysiewicz waves to the gallery beford being sworn in at the Capitol in Hartford, Conn. on Wednesday, January 9, 2019. HARTFORD — State Comptroller Kevin Lembo is launching an analysis of state payroll and employment records to identify gender or racial disparities in the salaries, hiring and promoting of the state’s nearly 50,000 employees. Lembo wants Connecticut’s employment practices to be an “example” for private-sector workplaces, said Tara Downes, a spokesperson for the Comptroller’s office. The study is not prompted by complaints or specific concerns, she said Tuesday. The comptroller’s findings will be made public, Downes said. Lembo and his staff will prepare a policy memorandum and present it to Gov. Ned Lamont’s new Council on Women and Girls, which Lembo has a seat on. “I love Kevin Lembo’s initiative because I am not aware that there has ever been such a pay equity examination done for the state of Connecticut’s workforce,” said Lt. Gov. Susan Bysiewicz, who chairs the council. Downes confirmed that the comptroller’s office has never before conducted such a study. The analysis will begin in the next few weeks, Downes said. Many staff from the comptroller’s office will be involved. A vast majority of state employees are unionized. The union AFSCME Council 4, which represents about 14,500 of public sector workers in Connecticut, supports Lembo’s study of state employment, said Jody Barr, executive director of the union. “The natural purpose of a union is to fight the disparities in gender and race,” Barr said. Barr is aware of concerns about inequities among state workers. “We support the governor in making the bold changes to make it fair for everyone,” he said. The state now employs 26,073 women, 23,539 men and 97 individuals who did not disclose their gender, data provided by the Comptroller’s office shows. About 56 percent of state employees identify themselves as white, the comptroller’s office said. Approximately 14 percent identify as black and 9 percent as Hispanic or Latino. Three percent say they were Asian. About 17 percent of employees do not specify their race or their race is unavailable. In the late 1980s and early 1990s, unions pushed for a pay-equity study of state employees, said Larry Dorman, public affairs coordinator for ASFCME Council 4. An eventual study confirmed women were underpaid. In 1995, the state and unions reached an agreement to form a joint committee to address job classification, structure and payment problems. The committee has since been abolished. Now, state employees may take pay-equity issues to arbitration, said Chris McClure, spokesman for the state Office of Policy and Management.